This Friday at 9PM join host artist Andre Juste as he interviews Dr. Philippe Lerebours on his life and legacy documenting Haitian art history. Dr. Lerebours is the author of "Haiti et Ses Peintres de 1804 à 1980". He has a doctorate in Art History from the Sorbonne University in Paris. In a career that spanned decades, he had many responsibilities, including director and curator of the Musée d’Art Haitien du Collège St. Pierre and Head of the National School of the Arts (ENARTS). He will be honored this Sunday September 27th at La Caye in Brooklyn during Agape Littéraire for Philippe Lerebours organized by Le Monde de L'Éducation et de la Communication Culturelle from 4-7PM. Find RSVP and more details. Host Andre Juste is an artist and art critic evolving in the New York art scene whose work has been noted for defying stereotypes of Haitian art. He has contributed a chapter titled Haitian Art to Henry Louis Gates and Anthony Appiah's Africana: The Encyclopedia of the African and African American Experience. 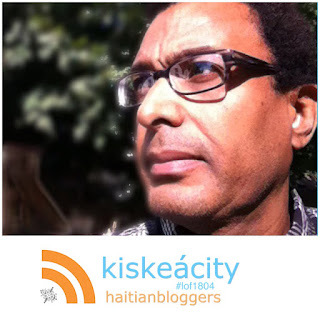 Listen online live or archived at http://www.blogtalkradio.com/pancaribbean/2015/09/26/legacy-of-1804-with-dr-philippe-lerebours-lof1804-haiti-art. Listen (Live Only) on the phone at (714) 242-6119. Dr. Philippe Lerebours was ill and could not join us but he has been rescheduled for Friday October 23rd. I ended up interviewing artist Andre Juste about recent shows of Haitian art in Paris, France: "Haiti: Deux Siècles de Création Artistique" at the Grand Palais and Hervé Télémaque at the Centre Pompidou. See the live tweet recap below.